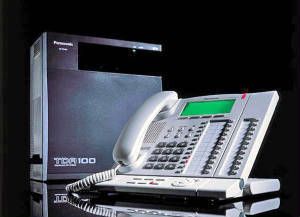 EDS are approved dealers for the Panasonic range of Telephone Systems. All systems are backed by Eurocom's 12 month parts and labour guarantee which is provided on site by EDS technicians. From apartments to large city hotels there is a telephone system that will meet your needs. IP connections provide low cost inter-office connections across continents. The Panasonic KXT7130 digital smart phone for the KXTES 824 exchange.